Where Would a Level Squish Get Us? Levels can be both boon and bane for MMORPGs. On the boon side, they are an easy way to dole new skills at a reasonable pace, they are useful for gating content, and they give players both a sense of progress as they level up as well as a benchmark for where they stand in the game. The downside is that when a game is a success and the company wants to sell more content to players, the go-to approach has been to simply add more levels. If some levels are good, then more levels must be better! But after a few rounds that leads to the huge gap between new players starting out and the main mass of players, which is usually concentrated in the current high level content. That can discourage new players and make alt creation a chore. That has led to some of the work around to which we have become accustomed. There is the simply expedient of reducing the level curve, allowing players to zip up in levels and through content quickly. When that isn’t enough, there is the insta-levels plan, where you give out and/or sell level boost that bring you into the current content. That has become fairly common as some core MMORPGs have passed the level 100 mark. Every three years we do a level increase, and we have changed the way some things work. Increasing the level cap is just in the DNA of the genre it seems. 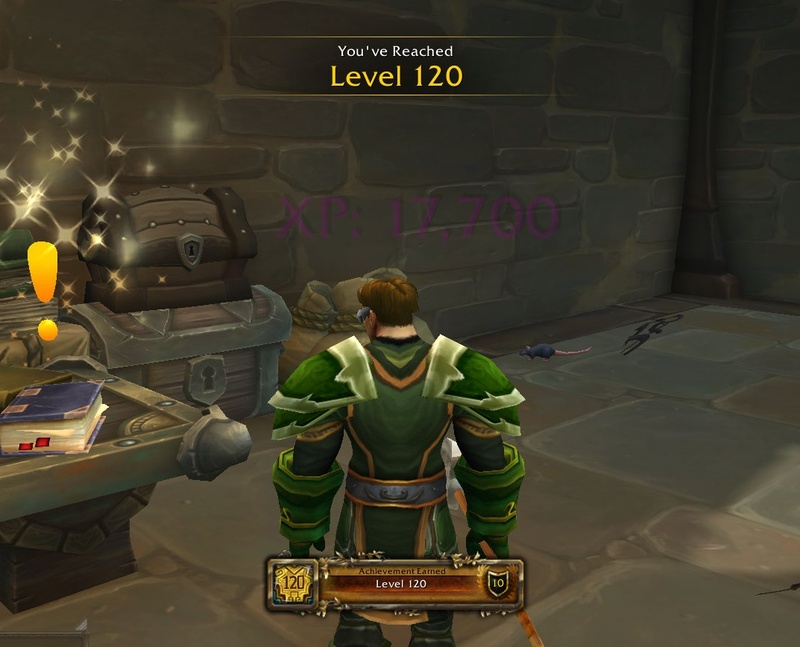 Over the years Blizzard has reduced the experience curve for leveling, added classes that start levels into the game (Death Knight and Demon Hunter), offered level boosts, and played with level scaling in older zones in order to make the climb to the level cap less of a barrier. That seemed radical enough that I went to go listen to the broadcast over at Twitch, just to make sure I heard exactly what was said. The question that brought it up is at the 53 minute mark of the replay. This link should bring you right to it. With that teeing things up, Ion Hazzikostas and Josh Allen went into a brief but serious talk on the problems with levels in the game. 120 is a very big number. With the current talent system you no longer earn points for your spec tree every level like you used to in the past, so that most level up moments don’t bring much to the player. And this is especially true in the current Battle for Azeroth content where everything in the zone levels up with you, so you don’t feel any more powerful and, in some cases, weaker. That situation led me to ask why they bothered with levels in this expansion. So I suppose it is unsurprising to hear that the WoW dev team has seriously considered a level squish. The idea sketched out was to take the current 120 levels and squish them back down to the original 60, thus setting the new player just half the distance from the level cap that they were before. With the work they have done to make zones scale over a broader range of levels, and the stat and ilevel squishes they have done before, the climb to 60 could be quite viable. But it would be strange. Going to Outland at level 30, Northrend at 35, Pandaria at… 42.5 I guess… and so on. And I guess your fresh death knight would be a level 28 character now? At what level can I go back and solo old raid now? In a year when they are releasing WoW Classic I have to imagine they realize the nostalgia impact of certain level ranges. That is only where the issues begin. The optics are bad, with everybody losing half their levels… even if levels are meaningless taking things away from players is always a bad draw… and all of the data on the internet about the game being made irrelevant… or at least incorrect… in a flash. And, of course, the real blocker to my mind is that it doesn’t actually solve the problem. Not by itself anyway. The problem is that most of the player base is at the level cap and new players have to walk a long path to get there. Changing how you measure that path doesn’t actually change the distance one needs to travel. I get that, in the scope of the talk, they were speaking of more than just a level squish. This would be a full redesign with probably yet another skill spec plan so that individual levels would feel more meaningful. That is a noble idea, and I expect we’ll get many more class overhauls and specialization reworks over the years. But what happens with the next expansion? And there will always be a next expansion coming, at least every other year for some time to come. Unless Blizz has something in mind for an alternate advancement path ala EverQuest, they are going to slap 5 or 10 more levels on top of and we’re back to climbing the level ladder again. With that expansion will have to come a new insta-level booster as well as a further reduction in the experience curve needed to get new characters more quickly into the latest content. Oh, and by tradition, the next expansion has to break, invalidate, or trivialize the previous content anyway. New spec changes, new gear, new stats, new whatever… it is just what happens when you heap a pile of new content on top of the old. All of which is why I was on that no good expansions thing a while back. We love expansions, because we love the game and just want more of it. But they inevitable stretch the game out beyond reasonable dimensions and lead to a focus on the new over the past. Still, I appreciate Blizzard talking about this sort of thing in a frank way and letting us know that they are as aware of the problem as we are and have been exploring even some rather radical solutions. In the end, however, they are stuck with the system they went with and there are no easy solutions. If there were, we would have heard about them by now. Of course, that won’t stop the Monday morning quarterbacks from throwing stones. Calling Blizzard lazy and stupid for not having a magic solution to a problem that nobody else has solved is the norm. This is why I am a bit surprised about Blizzard being this frank at times. We want the company to give us more info, then turn into petulant children when they do, expressing mock outrage as though Blizzard has just now realized that this might be an issue. In any case, we won’t see a level squish. It just changes too much for too little benefit. But I am glad to see they are serious enough about the issue that they would discuss that level of change. I suspect, in the end, we’ll see focus on making each level in the next expansion seem more meaningful. But reworking everything… be it 60 or 120 levels… to make each and every one meaningful seems unlikely. Addendum: A Related post from about five years ago. This has been a thing for a while. This entry was posted in entertainment, MMO Design, World of Warcraft on March 25, 2019 by Wilhelm Arcturus. Then there is TorilMUD, which has not raised its level cap in over 25 years. It was level 50 back in 1993, it is level 50 today. I think more than levels, the fact that each expansion invalidates everything before it, difficulty wise, is the issue. It makes no sense that we go a full cycle of content (MC/Onyxia, BWL, AQ40, Nax40) without trivializing everything, but then suddenly its expansion time and everyone is soloing Onyxia. Why? Why can’t an expansion up the power curve as slowly as a tier of raid content does? You still get more powerful, numbers still go up, but at least things stay relevent. Dealing 100dps is better than 90, just like 200 dps is more than 90. But at least 100 is relatable to 90, and not more than double. @SynCaine – I am not sure how to address the gear obsolescence aspect of expansions. Sure, 100 is more relatable than 200, but does it really matter how much better the initial quest green gear is in the next expansion if it is better than the top mythic raid drops? That problem crops up even when there are no new levels. It comes up in EverQuest and EverQuest II with expansions that have no level boost. They have to gate new content and make it a challenge and give you a reason to raid all over again, so stuff from the new expansion is always better. So the new content had best be interesting and fun. But that is all a different problem than the too many levels and the level squish idea. When I read Syp’s post on this my first thought was “what difference does it make whether you call it Level 60 or Level 120 if you still have to play through exactly the same content?”. How is that going to work, exactly? Do you play through the same amount of content but only get a new level half as often? Do you get levels at the same rate but only have to do half as much content? Do Blizzard remove half the content and leave the xp the same or leave the content and cut the xp in half? Would anyone think any of those was more satisfying? More fun? SOE experimented with something like this in EQ2 when they started adding expansions and major updates that gave level cap increases on the order of two or three levels. They radically increased the xp required to do each of those levels so that a “bubble”, 20% of a level, took literally as long as a full level used to take. In that way a very small level increase could stand in for the traditional 10 level jump. That was no fun. Their current solution is to ramp up the xp needed for the added levels in the current expansion by orders of magnitude, thereby rendering all previous content meaningless in terms of gaining xp for characters at the top end of the game. End game players have to do current content and only current content if they want to level up when a cap increase appears but all other players can continue along in older content as if it were new (or, actually an awful lot faster than when it was new, due to all kinds of ancillary changes along the way). That’s not ideal either but it works after a fashion and of the various attempts to resolve the problem of leveling it’s the one I dislike least so far. I’m sure there are better options yet to be tried, though. @Bhagpuss – The level squish in the discussion was predicated on making each level you get deliver something new, an objective easier to accomplish when the number is 60 rather than 120. 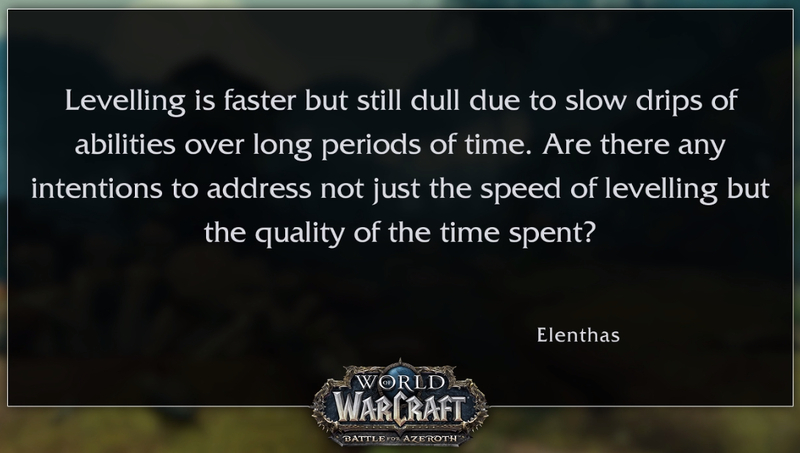 Otherwise the time to level would be the same. Maybe. I don’t know. As I said, it is not a viable idea for all sorts of reasons. This exact discussion came up in EverQuest II at one point in regards to guild levels. Guild levels were long and grindy and pointless and there was talk about maybe consolidating them so that your guild got something with every level so that they would feel like an accomplishment. Of course, this was in the SOE days and that fell out the window shortly thereafter and now I think guild levels are up to 200 or something crazy. As now, the idea of a squish then was a theoretical that never got any real traction. The current RPG world, MMO and otherwise, seems locked into a bunch of questionable design decisions made clear back in D&D. Levels, bigger and bigger experience requirements to make the next level, classes, racial attributes. I am a big fan of making a character’s capabilities be a function of time and actual experiences. EVE, up until they started buying and selling skillpoints, was fairly unique in making characters progress in realtime. It was frustrating to many players that nothing they did in game made their characters “stronger”, but it did serve to make the characters’ abilities more a function of their players’ skills, which I think is kind of neat. There’s a lot I like about EVE’s character progression, actually. For a more traditional RPG, I still think it’s worth exploring non-leveled systems that emphasize “experience points” less. It’s always been a frustration to me that somehow bashing the millionth monster just below your character’s level is still an “experience” gaining activity — indeed, the millionth monster is worth far more EP than the first (although the funny exponential EP scale squashes that back down). I wonder if a good design alternative would be to give experience only for actual unique experiences? It seems well within the range of modern tech to use something like the current “trophy” systems as an experience point system. Have skill points be a function of experience and time (real-time or active in-game time or some combination), replace level-based skills with a skill tree, and borrow EVE’s idea of providing reasonable skill roles for new players. Provide a more flexible alternative to the current respec systems, so that you could migrate skillpoints across your tree continuously at some low rate. Use a linear scale for skill levels in the tree, rather than EVE’s exponential one. Of course, I’m now essentially working on the design of a new game. It seems implausible that Blizzard could do much of any of this with WoW. I just really wish that *somebody* would explore a larger part of the design space for RPGs. I’m of two minds on this – the item squishes Blizzard has done twice now, including cutting item level value down, have gone fairly well, although it is also clearly an inflationary problem that will return every 1-2 expansions because their only solution to rewards is to up the power scale more and more. Mentally, it is still weird, but I’m also used to it and realistically, the positioning of old content in the new item level scale doesn’t matter (so long as the answer to “what ilvl is that gear?” is “lower than my current stuff.”). On the other hand, player level is so intrinsically tied in to the game experience that I would struggle with anything being cut there, and I imagine many players are the same. Academically, I get where they see the solution as viable – it’s less daunting, they could do another item squish to drop item levels back down to lower values, which puts off another squish in item level by years, but I think what you gain in new player comfort is lost the second they try to find info on the level cap (which will be contradictory and weird as you point out) and then you have to deal with existing players trying to find their way in such a system. It is doable, but it is going to be a problem. The core issue is exactly as you identify it – they want to restore the sense of reward and feel like they can’t do it in 120 levels without bloating action bars. I think they could figure out a way (annoying though they could be, maybe it is time to build spell ranks back in as progression) but the level squish is an “easier” solve for it. I imagine they’ll solve the level problem by rounding – you can do Cata and Pandaria from 40-45, WoD for 45-50, Legion 50-55, and BfA 55-60, with Death Knights starting at 30 and Demon Hunters at 50. They’ve already had to redo the progression the DK starting zone at least twice (Cata to account for talent squish, Goblins and Worgens, and MoP for the new talent every 15 system), so such a change wouldn’t be unprecedented, although it is a new scale of problem for sure. I don’t think there is an ideal solution short of a brand new game with a fresh perspective on progression, which cannot be bolted on to the existing game. I liked Final Fantasy X’s sphere grid, and while it isn’t an MMO, it would be an interesting model in that it is infinitely expandable (just tack on more grids) and allows player choice. You could even cap the number of moves a player could make in order to limit progression, but again – the problem is that such a thing couldn’t just be imported into an existing level framework without causing a riot (and would probably be worse than just chopping levels in half, IMO). anypo8, what you propose is a big part of the endgame progression in Guild Wars 2. In practice it really boils down to achievement grinding/elaborate questing. To me, it feels pressure-laden: can I get enough skill points to get by without being railroaded into jumping puzzles? It works for some, but it clearly isn’t everything to everyone. I’ll have to go back and look at GW2 again at some point. I don’t really remember how the skill system worked or felt; I don’t remember it as being either awful or spectacular. IIRC I liked it much better than WoW’s, anyhow. @TAGN – The idea of the expansion going to 100 vs 200 is that previous-content raid gear would be around 120, so better than the initial questing rewards, but then replaced at about the mid-point of the expansion, or maybe even towards the end. I think raiders would feel better about their gear making leveling faster/easier than being frustrated that the questing greens they are picking up aren’t useful.